President Maithripala Sirisena called upon the leaders of the states in the Bay of Bengal Region to take collective steps against drug menace narcotics smugglers use ocean routes for drug smuggling. Addressing the 4th Summit of the Bay of Bengal Initiative for Multi-Sectoral Technical and Economic Cooperation (BIMSTEC), he drew the attention of the leaders to the drug menace which is a great obstacle for the progress of the world community. “It is the menace of drugs and narcotics, heroine, hashish, marijuana and other drugs that are smuggled into the country mainly by sea. This has largely affected our youth and the school children. Illicit drugs have become the most serious challenge and we require more advanced technology and training for our coast guard to fight drug smuggling at sea,” he said. “I urge the BIMSTEC Association, the world community, and all the states to commit themselves to fight illegal drugs trafficking collectively and individually through a robust international programme that is more organized and stronger than now,” President Sirisena said. The President said that some powerful corporate groups sometimes even succeed in toppling governments and the leaders should be vigilant about them. He pointed out that climate change and natural disasters adversely affect the economies of the countries in the Bay of Bengal region emphasized that as the Bay of Bengal community, we have to find remedies to these challenges and work towards commitment for poverty alleviation under the BIMSTEC Poverty Plan of Action. 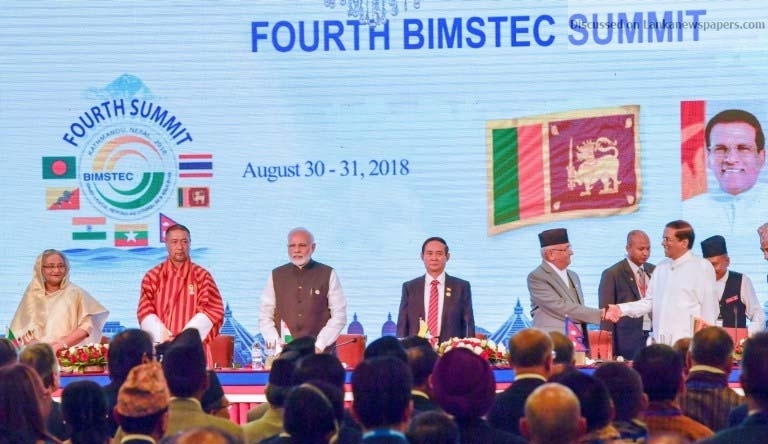 President Siisena said that BIMSTEC has vast experience and strength acquired over the past 20 years, and that could be fully utilized for meeting the challenges faced by the Bay of Bengal community. He called on the fellow leaders to give fullest support and continued cooperation to achieve the set targets and goals of BIMSTEC for the benefit of all our peoples. Address by President Maithripala Sirisena at the 4th BIMSTEC Leaders Summit on 30th August 2018, Kathmandu, Nepal. I am very happy that the BIMSTEC summit is very successfully held in Kathmandu, Nepal, which is one of our friendly countries. I take this opportunity to thank the organizers and the Prime Minister of Nepal for inviting me to this august forum, that renders important service to the member nations.In 2016, a BIMSTEC session was held in Gova in India. Today, we are meeting again today as the member states, with pleasure. Many issues our nations face today, as countries, regions and the world have many similar aspects. As friendly nations around the Bay of Bengal region, we have experienced many cultural, historical, economic affinities. Most economic, political, and social challenges that our nations face today are common. Climate change is one of them that challenge many of our economic and development plans. Climate change makes poverty reduction even more difficult, and in fact, it aggravates poverty. The menace of drugs is one a threat to the whole society. It is the menace of drugs and narcotics, heroine, hashish, marijuana and other drugs that are smuggled into the country mainly by sea. This has largely affected our youth and the school children.They hinder the development of our youth by undermining their education and knowledge.Illicit drugs have become the most serious challenge and they try to dominate world politics by toppling governments, patronizing politicians and governments favourable to them. I urge the BIMSTEC members, Initiative, the world community, and all the states to commit themselves to fight illegal drugs trafficking collectively and individually through a robust international programme that is more organized and stronger than now. As the Indian Prime Minister Narendra Modi mentioned about the noble intentions of BIMSTEC, to ambitiously promote a Blue economy, it is important for us to free our societies from corruption, fraud, and misappropriation of state assets. We talk about a Green economy as well as a Blue economy. In all these, we must ensure that democracy, human rights, and freedom of media are upheld in whatever the political model we adopt. That is the wish of the people. I am happy that during the last three and a half years since I became the President, democracy, human rights, rule of law and media freedom has been strengthened and independence of judiciary has been established. Institutions have been established to fight corruption. Actions were taken to punish those who are guilty of corruption, bribery and malpractices irrespective of their status of political affiliations. In order to achieve the noble goals of the BIMSTEC, I stress on the need to be strongly committed to strengthen these sectors. It is also important to make development inclusive and progress in free education and health, agriculture, tourism, and all other major contributors to the economy. It is important, therefore, as members of BIMSTEC, that all nations find consensus on the what suits our region best in carrying out the unique economic, political and social development agendas of our nations. The BIMSTEC regional bloc is one of the fastest growing regions in the world. Sri Lanka, as an Island Nation wishes to make maximum use of the ocean with new light on ocean research, tourism, fisheries and marine resources. BIMSTEC is a multi-functional organization that synergizes our efforts to achieve many goals. I do not think that BIMSTEC should not be limited only for cooperation in certain areas. We can identify and agree on a common agenda for our region taking into consideration, the many challenges that our nations face today, at national, regional and international levels. BIMSTEC has vast experience and strength acquired over the past 20 years, and that could be fully utilized for meeting the challenges faced by the Bay of Bengal community. This organization prospers as it is based on the determination and mutual trust among us. The political and diplomatic leaders gathered here today have the knowledge, experience and the maturity it takes to for our collective success in this world, that reshaped by myriad technological advancements. I take this opportunity to call on my respected fellow leaders to give fullest support and continued cooperation to achieve the set targets and goals of BIMSTEC for the benefit of all our peoples. Each of us have unique cultural heritage, civilization, and a rich history that inform and enrich our future development agendas. The BIMSTEC provides a strong support to these ambitious paths. In conclusion, I express my pleasure and thank you, on behalf of the people and the government of Sri Lanka, as we stand together at BIMSTEC to achieve our the noble goals.